Expressing mass and material quality are common threads found in Jobst’s iconic collection. The Ridge Lamps create striking silhouettes that echo early 20th century design and sculpture. The geometric form of the oak base is contrasted with a smooth face and a ridged textured surface. The oak has been ebonised using a technique that reacts with the tannin in the oak creating the dark surface. The refined element of the oak is contrasted by the solid limestone block and the textured linen shade. Louis Jobst's award winning designs are inspired by both functional and sculptural form. The choice of material is an important one; by connecting with ‘a material’s rawness’, he often finds the process of making is as significant as the end product. Jobst is interested in the juxtaposition between robust materials and rigorous processing, thus creating an unconventional and blemished effect. This in contrast reveals the elegance and delicacy of the components. Through designing and making sculptural lamps and furniture, Jobst transforms large-scale industrial processes into small-scale batch produced products. His passion for architectural forms such as arches, columns and monoliths are expressed in this work. These are presented through a contrasting palette of materials, textures and colours, resulting in his unique style. Jobst first trained as an architect, working for practices such as Carmody Groarke, where he gained an interest in high quality construction materials and simple geometric forms. In 2013 he began working for the renowned Mike Smith Studio, collaborating on major art fabrication projects both in the UK and abroad. This has provided Jobst with skills and experience working with a vast range of materials and across a broad range of scales. 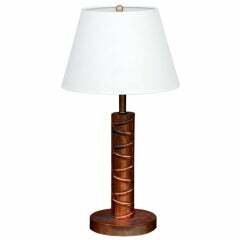 Fluted and leaf carved plinth-based wood column lamp from 19th century France with custom linen shade. This floor Lamp was designed in the 1970s. 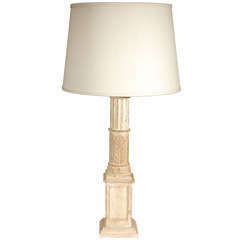 It consists of an illuminated glass base and fabric shade with floral pattern. Feel free to contact us for more detailed pictures. Vintage brass bamboo lamp and new custom linen shade, newly rewired. Measures: Shade diameter 16.5".